Recipe by Maria Benardis Gourmand winning author of “My Greek Family Table” and “Cooking & Eating Wisdom for Better Health”. Mpiftekia can be shaped into patties, wrapped around a skewer or shaped into ovals and grilled, baked or fried. 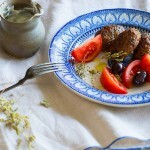 Serve with a simple salad, tzatziki and lemon, or pack into pita bread and eat like a souvlaki. Soak the bread in 60 ml (¼ cup) water for 5 minutes. Drain and squeeze out the excess water with your hands. Place the bread in a large bowl with the beef, tomato puree, olive oil, onion, parsley, egg, garlic, cumin, oregano and cheese and season with salt and pepper. Using your hands, mix until well combined. Cover the bowl with plastic wrap and refrigerate for 1 hour to firm up. Using wet hands roll ¼ cupfuls of the mixture into oval shaped meatballs and arrange in a deep baking dish. Drizzle with olive oil and pour 60 ml (¼ cup) water into the base of the dish. Transfer the baking dish to the oven and cook for 50–60 minutes until golden. Serve with tomato and olive salad, tzatziki and lemon wedges.